Department of Otolaryngology > Faculty > Naveen Bhandarkar, M.D. 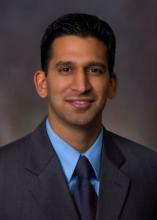 Naveen D. Bhandarkar, M.D. is board certified in Otolaryngology – Head and Neck Surgery with subspecialty fellowship training in Rhinology and Endoscopic Sinus & Skull Base Surgery. He received his medical degree from the Ohio State University, and finished a residency in Otolaryngology – Head and Neck Surgery at University of Illinois at Chicago. He then completed his fellowship training at Oregon Health & Science University under the direction of Dr. Timothy Smith. Dr. Bhandarkar treats all ENT disorders, but specializes in medical and surgical treatment of all disorders related to the nose and sinuses including sinusitis, allergic rhinitis, nosebleeds, nasal blockage (septal deviation, turbinate hypertrophy), smell and taste disorders, polyps, and nose / sinus tumors. He is specifically expertly trained in performing minimally invasive endoscopic nasal and sinus procedures, including image guided sinus surgery, nasal septum and turbinate surgery, balloon sinus dilation (balloon sinuplasty), and tumor removal. He is capable of performing many of these procedures, such as balloon sinuplasty, in an office setting avoiding the need for general anesthesia with quicker recovery. Dr. Bhandarkar is an integral part of the UC Irvine Medical Center multidisciplinary skull base surgery program that offers minimally invasive endoscopic treatment using the most cutting edge techniques and state of the art technology for conditions such as pituitary tumors or sinus growths that breach the interface between the sinuses and brain and/or eye. In addition, he has extensive experience in performing endoscopic procedures related to eye problems such as excess tear production (dacryocystorhinostomy) and Graves’ thyroid eye disease (orbital decompression) often in a collaborative manner with Ophthalmology. As part of his practice at UC Irvine, Dr. Bhandarkar enjoys an active role in academic endeavors. He regularly attends meetings of the American Academy of Otolaryngology – Head and Neck Surgery, American Rhinologic Society, American Academy of Otolaryngic Allergy, and Orange County Society of Otolaryngology – Head and Neck Surgery. He is also a reviewer for several major peer-reviewed Otolaryngology journals. Finally, he is extensively involved in resident and medical student education and participates in clinical research primarily related to chronic sinusitis.